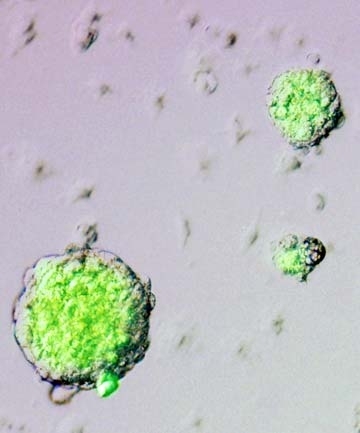 Caption: A new type of stem cells, called STAPs. Updated July 2, 2014: Since these two papers were published in the journal Nature, more than a dozen research teams have been unable to replicate the STAP findings. On April 1, RIKEN found the main author Haruko Obokata guilty of scientific misconduct. On July 2, Nature accepted requests from all co-authors to retract the papers and published an editorial discussing the retractions. Taking a 30-minute soak in a bath of acid might not sound like a good thing. But it happens to be the latest—and the most shockingly simple—strategy for creating stem cells. The powerful appeal of stem cells for science and medicine lies in the fact that they are both self-renewing and pluripotent, which means they can develop into almost any type of cell in the body. Stem cell technology offers an essentially limitless supply of specialized cells to researchers for exploring the fundamentals of biology, screening for new drugs, and developing new ways to regenerate damaged tissue and repair diseased organs. When this technology first emerged in the 1980s, the only way to obtain stem cells was by harvesting them from an embryo. Then, in 2006, Shinya Yamanaka at Japan’s Kyoto University stunned the scientific world when he figured out how to reprogram adult skin cells into stem cells using a “cocktail” of just four genes. This new kind of stem cells, called induced pluripotent stem (iPS) cells, earned Yamanaka the 2012 Nobel Prize in Physiology or Medicine. Now, we have yet another approach to stem-cell production, developed by researchers at the RIKEN Center for Developmental Biology in Kobe, Japan; and Brigham and Women’s Hospital and Harvard Medical School in Boston. And it’s one that appears to be even easier and more efficient than the method used to make iPS cells. Think about it—if you were going to try to develop a method that would convert blood cells to stem cells, how would you test it? You would need a quick screening assay. So, the investigators used cells from mice that produced a green fluorescent protein (GFP) whenever the Oct4 gene (a marker of pluripotency) was active. Researchers then harvested white blood cells from the spleen of 1-week old GFP-Oct4 mouse and exposed the cells to a variety of environmental stresses. And presto! They started to see glowing green cells. What turned out to work best at spurring this transformation was a half-hour soak in a mildly acidic liquid with a pH of 5.7 (less acidic than black coffee!). While this may not sound too traumatic, the acidity actually killed about three-quarters of the white blood cells. But amazingly, of the one-quarter that survived, about 30% turned into cells that made lots of GFP-Oct4 and strongly resembled embryonic stem cells. Still, looks can be deceiving. To provide more proof that such a simple procedure really could turn white blood cells into stem cells, the researchers had to show that a number of other genes associated with pluripotency were also turned on. They were. And they had to test whether these cells would make teratomas (benign tumors) if injected into mice. They did. 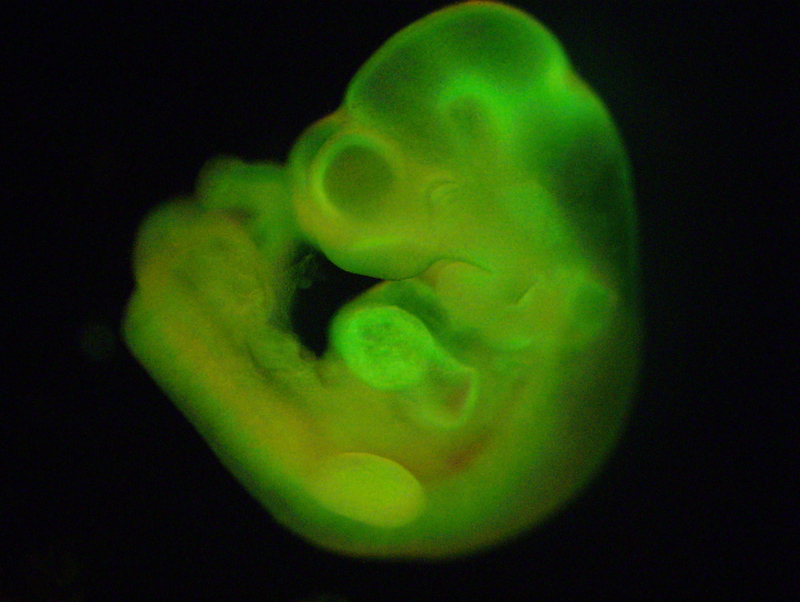 Caption: Mouse embryo injected with a new type of stem cell, called STAP, which is tagged with a green fluorescent protein that indicates pluripotency. Then, came the most stringent test: researchers injected the cells into an early mouse embryo to create a mixture, or “chimera.” As the mouse grew, the cells that had been treated with acid correctly formed all the tissue types in the adult animal. These chimeric mice were then successfully bred and produced healthy, normal offspring—derived from the original acid-treated cells. What should these special cells be called? The researchers named them STAPs, short for Stimulus-Triggered Acquisition of Pluripotency. What was particularly striking was that the STAPs also seem capable of contributing to the extra-embryonic tissue that forms the placenta. That’s not the case with iPS cells. This is enormously interesting scientifically, but has also raised concerns that STAPs might provide a ready pathway to animal, or even human, cloning. While STAPs appear to be a major breakthrough, this work must still be replicated in other labs and extended to cells from older mice and from humans. And, although we still aren’t sure exactly which type of stem cells will work best for which applications, one thing is clear: the potential that this field holds for advancing science and medicine is amazing—and getting more so all the time. Stimulus-triggered fate conversion of somatic cells into pluripotency. Obokata H, Wakayama T, Sasai Y, Kojima K, Vacanti MP, Niwa H, Yamato M, Vacanti CA. Nature. 2014 Jan 30;505(7485):641-7. Bidirectional developmental potential in reprogrammed cells with acquired pluripotency. Obokata H, Sasai Y, Niwa H, Kadota M, Andrabi M, Takata N, Tokoro M, Terashita Y, Yonemura S, Vacanti CA, Wakayama T. Nature. 2014 Jan 30;505(7485):676-80. Why do they have to test whether these cells would make tumors if injected into mice? How does it prove that this procedure really does transform white blood cells into STAP (stem cells)? Thanks for the question, Almontasar! The ability to form teratomas is considered the most rigorous test for pluripotency, which is one of the prime characteristics of stem cells. The reason for this is that, unlike other tumors which typically contain only one type of cell, teratomas contain tissue derived from the three primary layer of cells that form during embryogenesis: endoderm, mesoderm, and ectoderm. To learn more, go to: Teratoma formation: A tool for monitoring pluripotency in stem cell research. Zhang WY, de Almeida PE, Wu JC. Why would you take your time and effort to write about this study in Japan that will probably be retracted when you have not said a word on your blog about … the most advanced HESC [Human Embryonic Stem Cell] trial in this country? How do you let Lanza’s & Daley’s stem cell lines sit on the sidelines while China & Japan are moving light years ahead of us? One note: In 2013, NIH approved 45 human embryonic stem cell (HESC) lines for use by NIH-funded researchers.